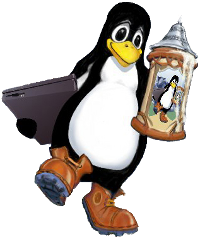 If you have never been to a Linux Bier Wanderung before, you are most welcome to join us. To describe the event a bit better, I've tried to answer some questions you might have about the event. Is it all about Linux? Whether you bring a computer or not is entirely up to you! Some of us get involved with working on projects, others (such the author) prefer to spend the week away from computers enjoying the scenery. What happens in a day at LBW? In the morning we will usually meet in the hall, which serves as a meeting point for the week. There will likely be notices up for planned walks, excursions, talks, or other events. You can head off on one of these, or relax in the hall. In the evening a pub-of-the-day will be selected, and we will head there for food and drink. This year we have a kitchen in the hall, so cooking together there may well happen. When do I need to turn up? See the website or registration site for the next event for the precise dates. You don't need to stay for the whole week, or indeed stay over night. If it helps you decide when, our registration site has a calendar of events people have planned in advance. Where do I stay? You need to organise accommodation yourself, there is no recommended place. The organisers will usually compile a list of local accommodation of varying types, ranging from a campsite to hotels. What does it cost? To cover the cost of hiring the hall there is a suggested donation, probably in the region of €30 per person. What should I bring Things that you would like to enjoy playing with during the week. Walking boots, laptops and bikes are popular. Others bring radio equipment, electronics and climbing gear. Up to you! How do I find out what's going on? We have a lowish traffic mailing list. If you're thinking of coming, join it. It's the best way to find out what is organised, and what we could organise. You can also find us on IRC. Who organises it? Each year a different team organises the event. Volunteers are welcome! You can read about us in Linux Magazine.